After American Motors dropped the AMX/3 development Giotto Bizzarrini wanted to turn this special super car design into a real product bearing the Bizzarrini badge. Sciabola is an Italian word meaning saber in English. This was the name Giotto Bizzarrini selected for the planned super car model that came out of the work he did with American Motors on the AMX/3. Perhaps saber was selected because of the sharp shape of the front of the AMX/3 or maybe Sciabola is just a cool name that fits a really cool super car. The AMX/3 is as much a Bizzarrini as any of the models that bear the Bizzarrini badge. The way the AMX/3 was created is similar to how the Bizzarrini GT 5300 was created. The AMX/3 development was funded by American Motors, styled by Richard Teague of AMC, powered by an American Motors engine and was branded AMC. The Bizzarrini GT 5300 was funded by Iso, styled by Giugiaro of Bertone and powered by Chevrolet as were other Isos at the time. Initially it was branded an Iso and changed to the Bizzarrini brand later when Giotto Bizzarrini and Renzo Rivolta, owner of Iso, decide to part ways. Giotto Bizzarrini is responsible for both the Bizzarrini GT 5300 and the AMX/3 chassis design and engineering. The AMX/3 bodies were built by Diomante and initially Drogo built the GT 5300 bodies. Shown here is a brochure for the Bizzarrini Sciabola. Once a brochure was made that meant that Giotto was serious. It is too bad he could not pull this off and make a hundred or so like he did with the GT 5300. Here is something you only see once every 15-20 years – an AMX/3 by Bizzarrini SOLD here on My Car Quest. There are only six AMX/3s and this is the only one that has sold in the past 15 years or so, as far as I know. My thanks to Walter Kirtland for the brochure images. This article was originally published in 2013. The AMX/3 is as much a Bizzarrini as any of the models that bear the Bizzarrini badge. The way the AMX/3 was created is similar to how the Bizzarrini GT 5300 was created. Giotto Bizzarrini tried to produce the AMX/3 as the Bizzarrini Sciabola. I believe there is a compagnie into The States who has make replica’s? Jack, only the first car was built in the the old Bizzarini building at Via della Padula 251 Livorno and it was built by Autofficina SD (owned by Diomante) who bought all the tools/tooling from the bankrupt Bizzarini company. At the same time car 1 was being finished, the second car was being built in Nichelino, Torino by ItalDesign in association with the Polytechnic University to improve the Bizzarini chassis. June 1969 the first car was sent to BMW for testing. December 5, 1969 the BMW test report on the torsional rigidity of car 2 was released. February 1970 Diomante moved out of the old Livorno building and starts Autocostruzioni SD in Moncalieri. Bizzarini operates under the corporate name Z2 as an external consultant for Autocostruzioni SD. Car 1 is stored and cannibalized for parts, Cars 2 is finished for road testing and track testing at Monza and chassis 3-9 are all built at Autocostruzioni SD in Moncalieri and cars 3-6 are finished there. Bizzarini used chassis 8 to build the Iso Varedo. 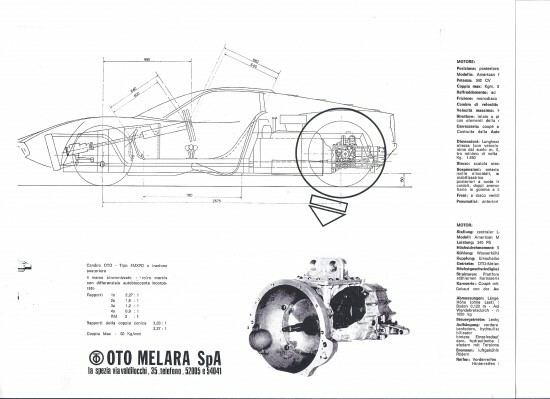 Unfinished car 7 was sold to Giordanengo to finish and unfinished chassis 9 was sold to Giordanengo to build the AMX Spider. Jack, Sciabola wasn’t a car, it was a marketing tool in an attept to sell transaxles. What you refer to as “Sciabola” was referred to simply as “AMX” by Bizzarrini and Diomante still has this car 6 in his home and labels it “AMX-3”. Giordanengo labeled his finished car 7 “AMX”. All 9 surviving chassis were built during the same time-frame by the same people and are all AMX/3 chassis. Cars 4, 6 and 7 are most similar to what you call “Sciabola” but all are indeed “AMX/3”. “Sciabola” is simply AMX/3 #6 finished after AMC “canceled” the project. The October/November 1970 Turin Auto Show was an attempt to generate interest in the “Bizzarrini AMX” and AMC offered to send parts for Bizzarrini to build 30 AMX/3 cars and AMC committed to buy 10 with Bizzarrini selling the remaining 20 but Bizzarrini declined. Nothing in this project was referred to as Sciabola. Later, the “Sciabola” marketing appeared for the 1976 Turin Auto Show in an attempt to sell transaxles only. Referring to Sciabola as a separate car is inaccurate and incorrect.